As interesting as it was to visit Lumbini, it was a good feeling to drive out of the dust and heat, and slowly make our way up from south to north through Nepalese hill country. 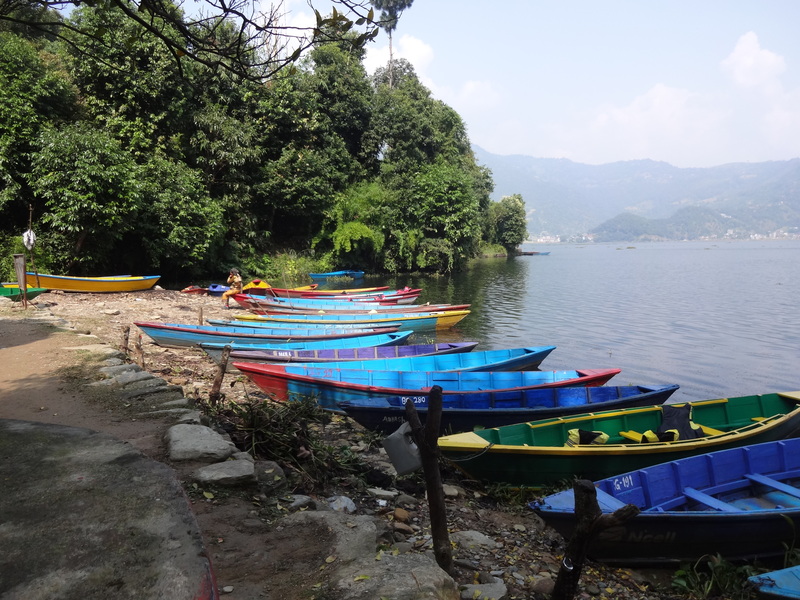 For about six hours we wound up and down hillsides on narrow roads, drove through small roadside small villages, and finally arrived in Pokhara in the late afternoon. This was my fifth or sixth visit to the city and I wanted to try a new location away from the hustle and bustle of Lakeside. 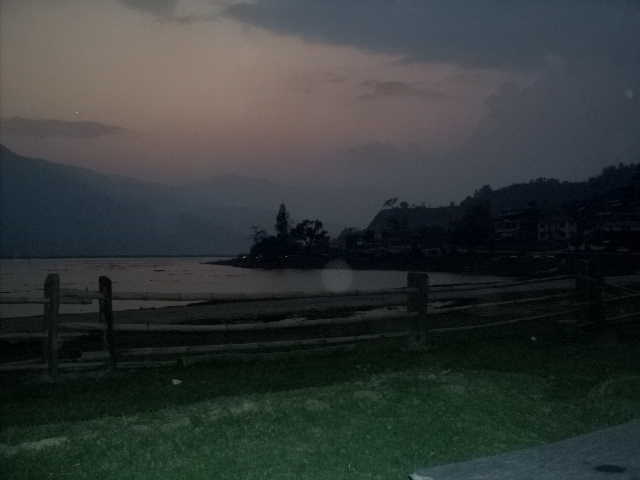 So I picked Maya Devi Resort on the north shore of Phewa lake. Its a quiet, undeveloped location with just the occasional paragliders who drop out of the sky on to the small beach and, unexpectedly, a very good Thai restaurant. 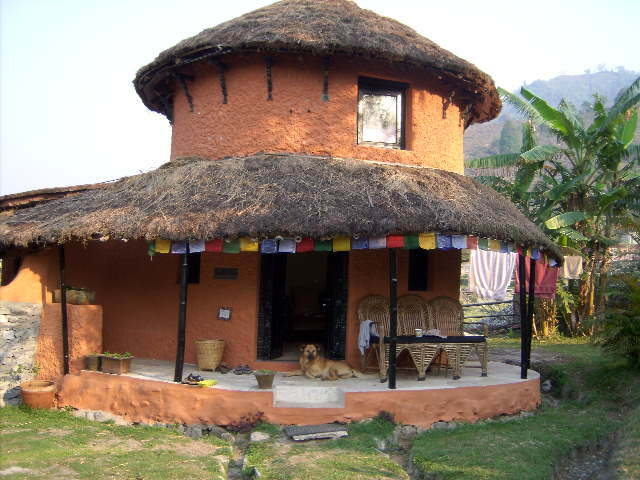 The resort is small and laid back, and specializes in parahawking, a unique type of paragliding. 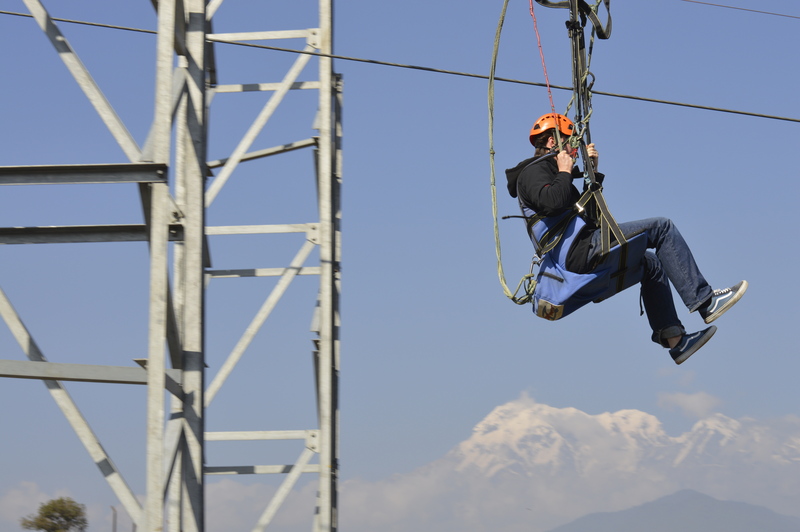 The owner rescues birds of prey and trains them to lead paragliders to the best thermals, and the paragliders gets a very cool flight experience with a bird. 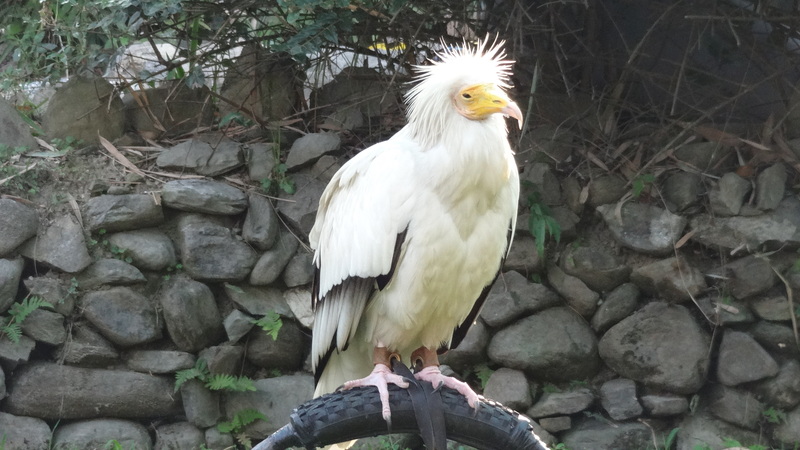 One of the Egyptian parahawking vultures – Bob, I think?! 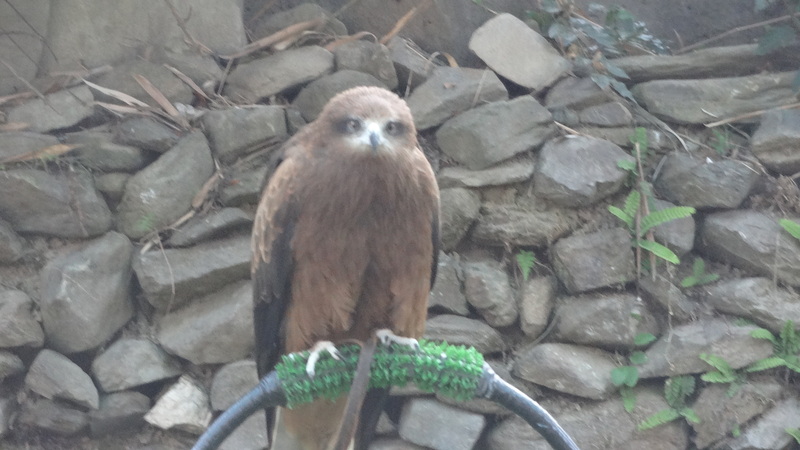 ….and one of his kyte friends. 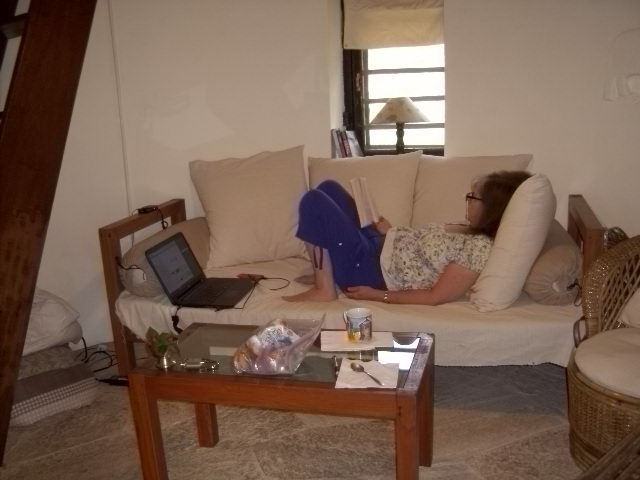 It was a quiet, relaxing 3 days. 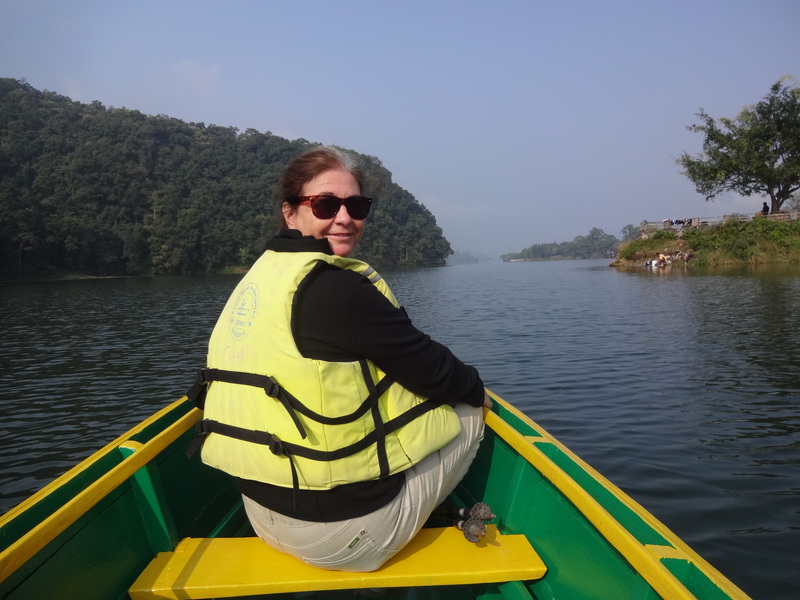 The downside was that Susie barely got a glimpse of the Himalayas — she should have had panoramic views – but we did get to spend time rowing on the lake, gossiping in cafes, and trolling around the shops at a much more leisurely pace than normal. 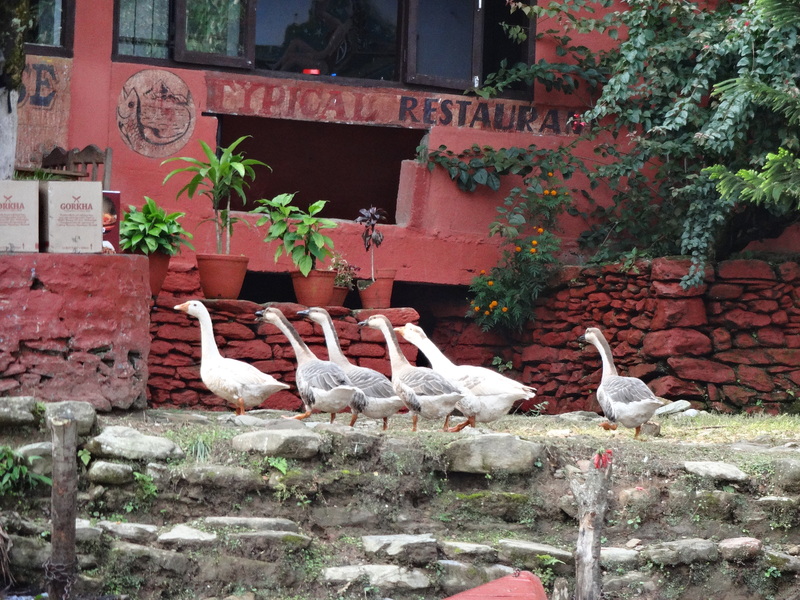 The next stop on our roadtrip was Pokhara, my second visit since our first time back in November. It was much more interesting to arrive by road than by plane, especially since the last visit had been very foggy and there was nothing to see from the air. Mist still hung around the town and lake, but this time the Annapurnas weren’t so shy and we had great views each day of our three day stay. 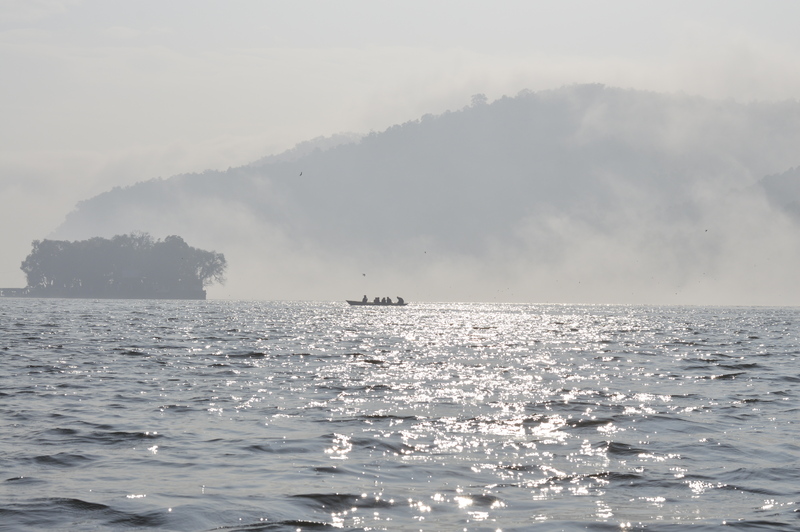 We took a morning boat ride across Fewa lake, while the mist still hung around. It was beautiful and a bit eerie at the same time as we watch silhouettes of oarsmen gliding over of the sparkling water. 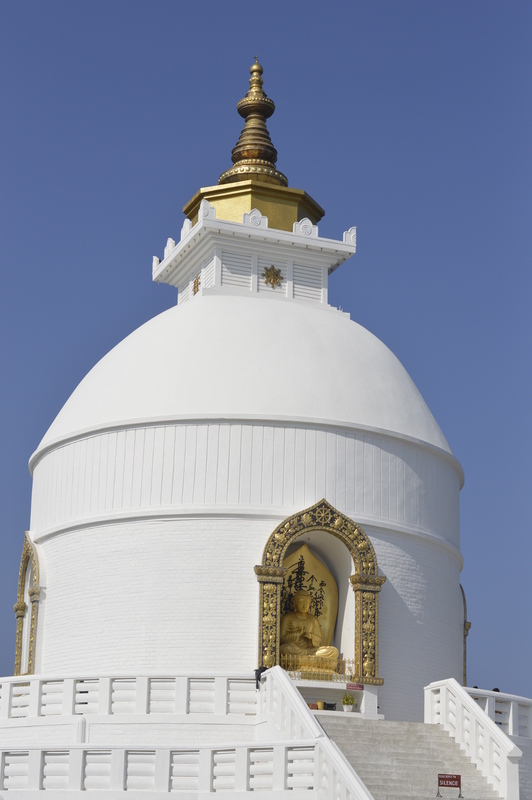 Our destination was the trail head up to the Peace Pagoda, a pleasant 1 hour hike up to the top of a hill. Halfway up we stopped at a small cafe for a cold glass of water and took in the views. When we’d had our fill of stunning Himalayan views, we drove back down the mountain by car, which took over half an hour on the dusty narrow road. (We’d walked up in an hour). When we arrived back in town the police wouldn’t let us drive our car back to the hotel, so we parked out of town and walked. 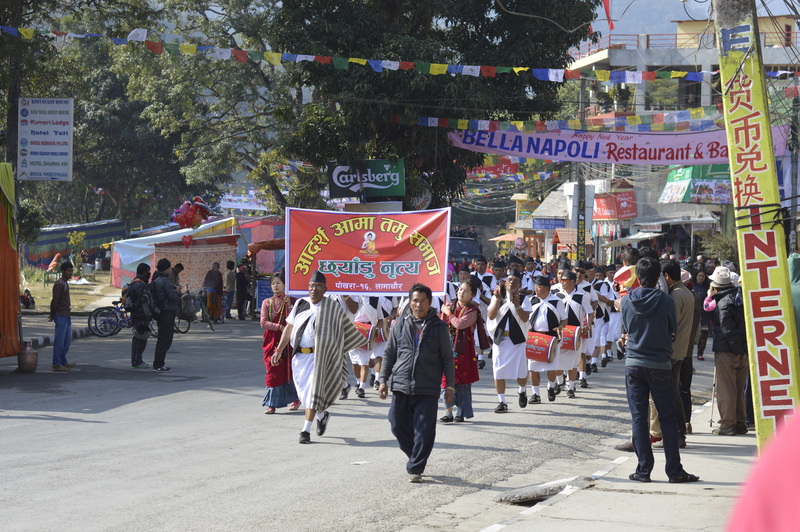 Pretty soon it became clear why, as music start and a group of Nepali VIP’s lead the start of what turned out to be a very long parade. 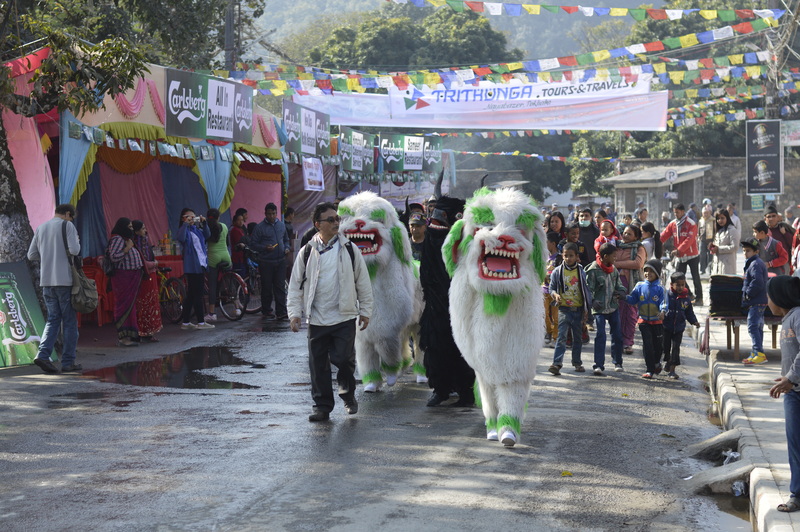 The colourful parade went by for a good half an hour: an amazing array of clubs, societies, musical and dramatic displays. 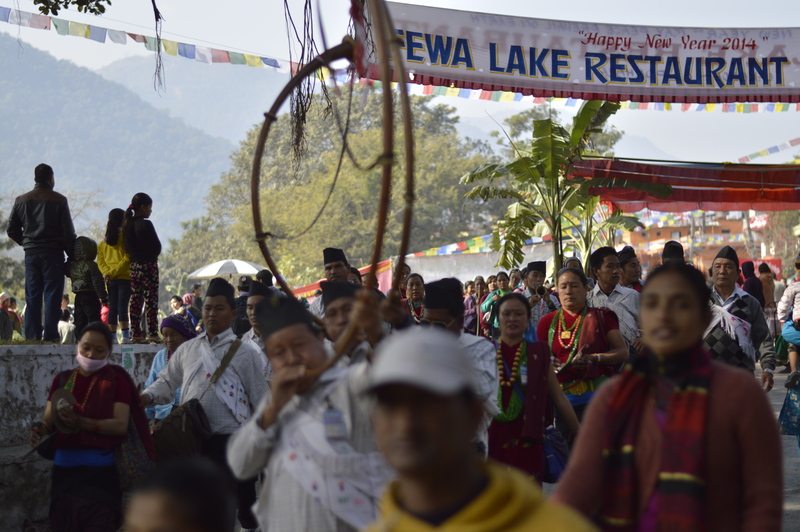 It heralded the start of the four day Pokhara Street Festival, now in its 15th year, aimed at the tourist celebration of New Year. Restaurants took their food out on to the streets at night, and competing vendors with tinny music systems blared out distorted music over one another. I could have done without that! From our street-side hotel the racket went on til late, but some how we managed to fall asleep anyway. After the thrill seeking duo returned, we headed out to lunch at Krishna’s Kitchen, a popular Thai restaurant on the North side of the lake. 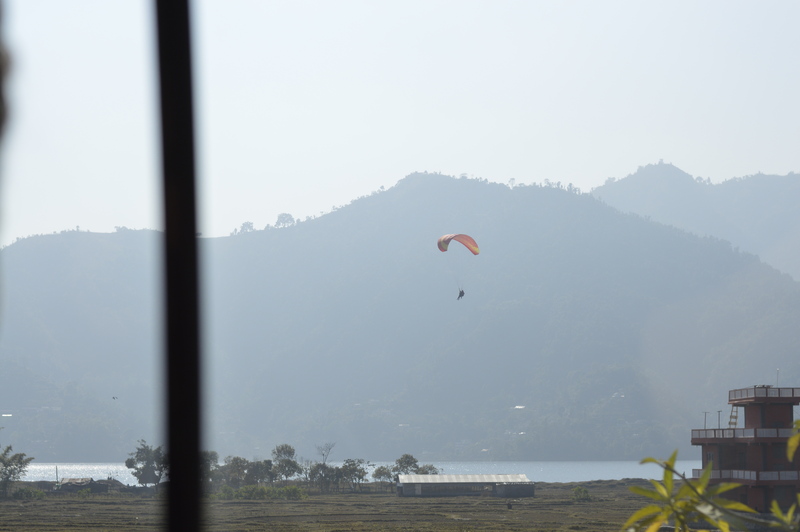 The food was good, but the best part of the experience was watching the paragliders land on the beach in front of us, some so low we could see the expressions on their faces. The location was perfect too…a beautiful sunny day, peaceful sparkling waters and no noise or crowds. Staying at Lakeside has been fun, but if we return for a few days, I think I’d like to say on the quiet North shore next time… it was a beautiful spot! Watching the paragliders land. This one was some distance away. Many practically came in over our heads. A misty early morning start. 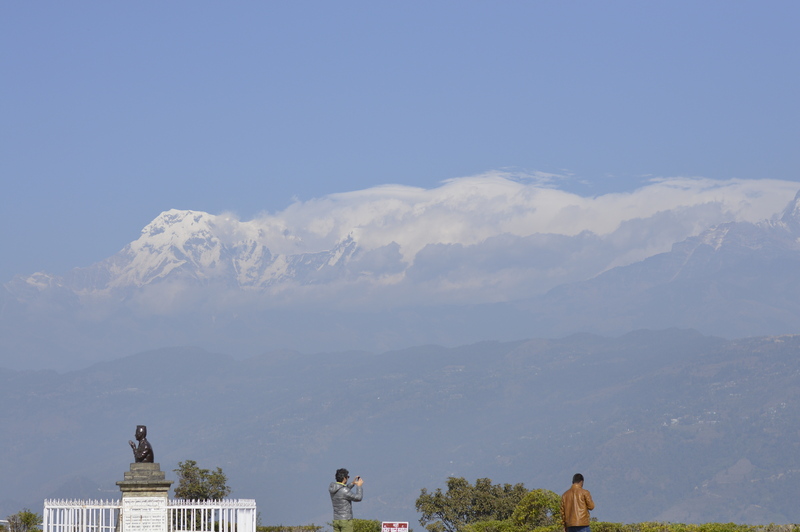 The massive Annapurna range is in the background, but you would never know it. Nepal is a landlocked country and after coming from the Philippines with its 7000+ islands, it slowly dawned on us that we hadn’t see a stretch of water for quite a while. 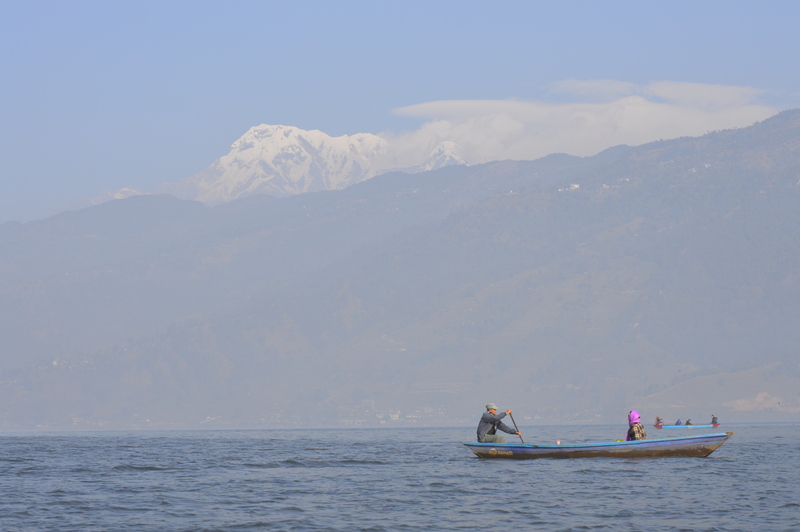 Pokhara has the country’s second largest lake, and the idea of being back on water again was very appealing. 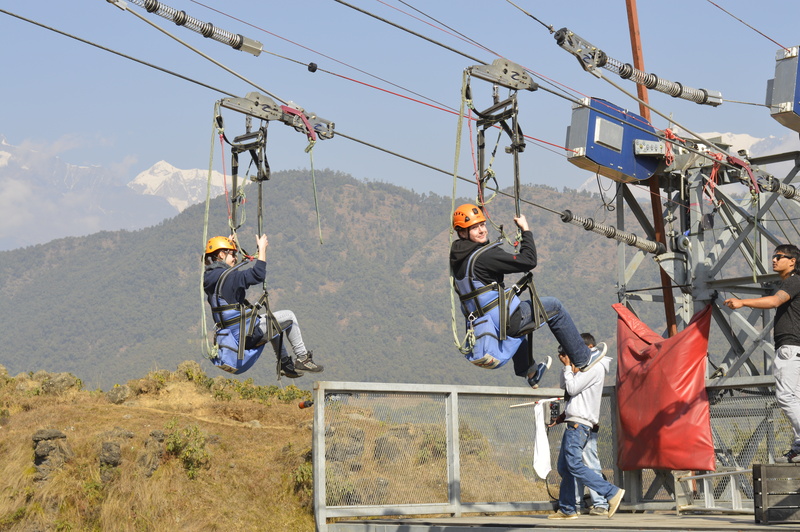 There’s a small tourist industry here, built around the Annapurna trail which starts in Pokhara. On the perfect day with no wind and clear skies, apparently you can see the Annapurnas reflected in the lake, but we weren’t that lucky. We arrived to a downpour of rain. 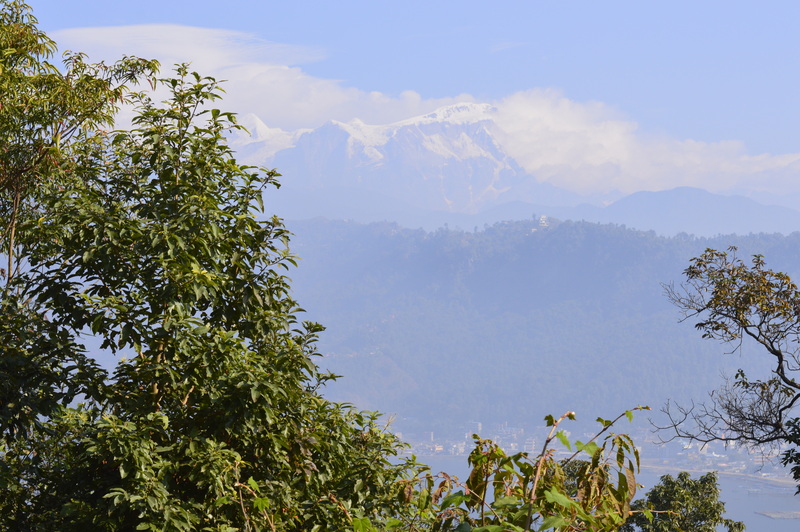 Subsequent days were dry and sunny, but the Annapurnas remained obscured in mist for our whole stay. Fortunately the lake was there and beckoned us forth. 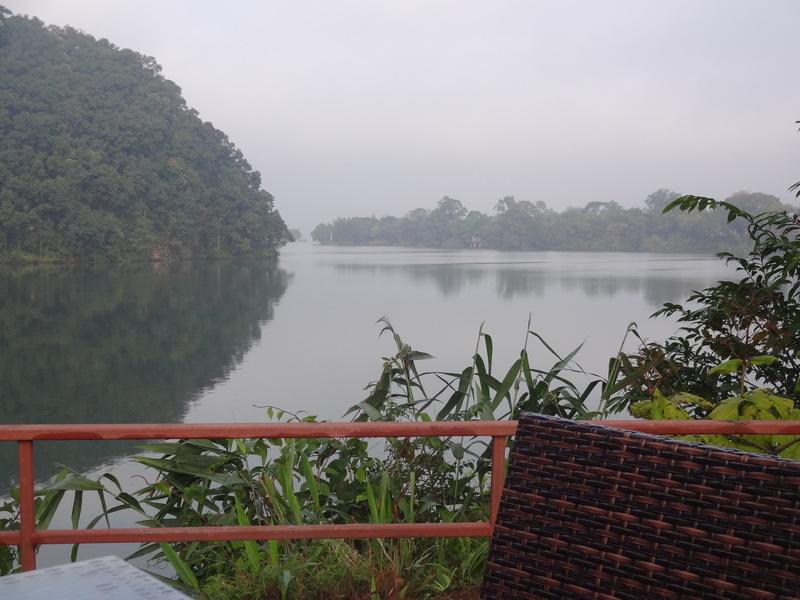 We stayed at a lakeside resort and it was an easy (and lazy) option to hire a boatman to take us across the lake to the trailhead up to the Peace Pagoda on the first morning of our stay. The lake sits in the middle of the town and its an easy paddle out to its center to enjoy the calm of the waters. There are no motorized vehicles and not much traffic. You can sit still and just hear birds and lapping of the paddle. Its very peaceful. The town lies on one bank and the jungle lies on the opposite side. 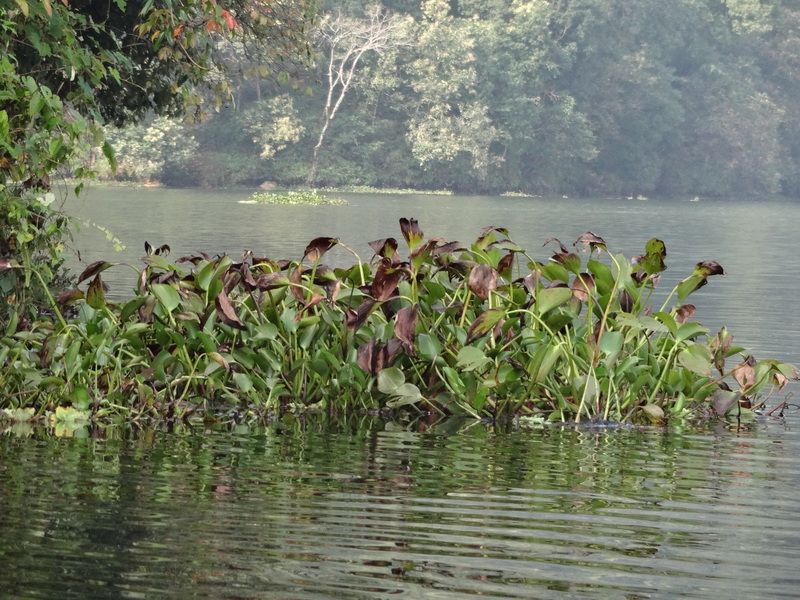 We skirted the green edges of the lake, past fishing nets and allsorts of aqueous plants (or weeds, maybe?). 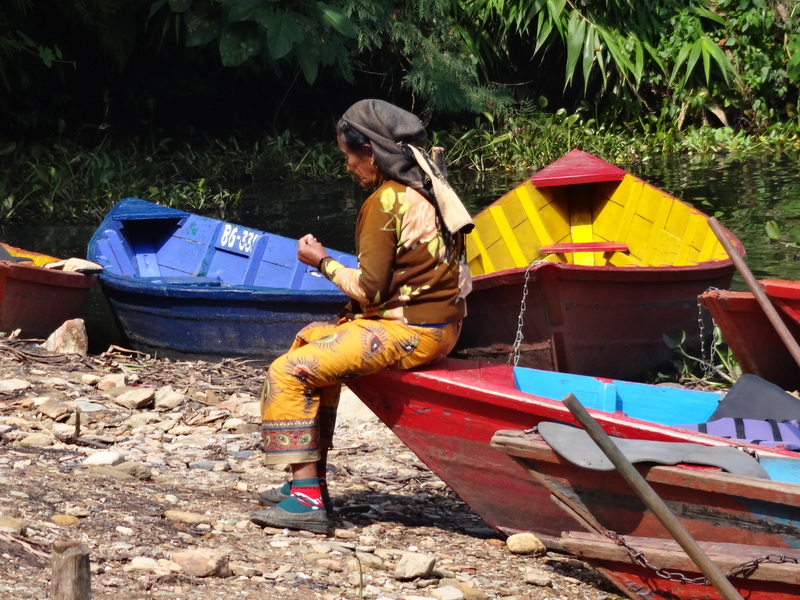 Daily life of laundry, fishing, and tourist activities went on around, but it never felt crowded or spoiled. 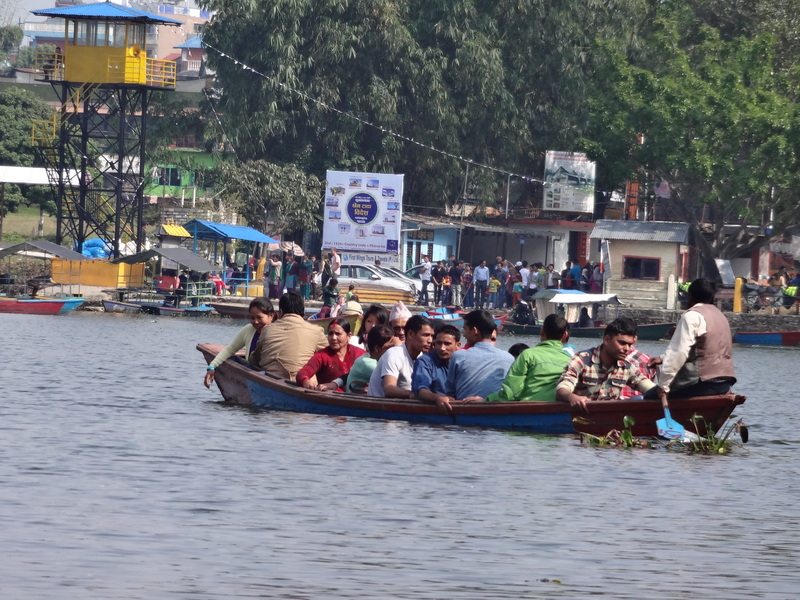 It was also a national holiday, and boat loads of visitors from the town were visiting the small temple island in the middle of the lake. For this reason we kept rowing past and didn’t stop to take a look. 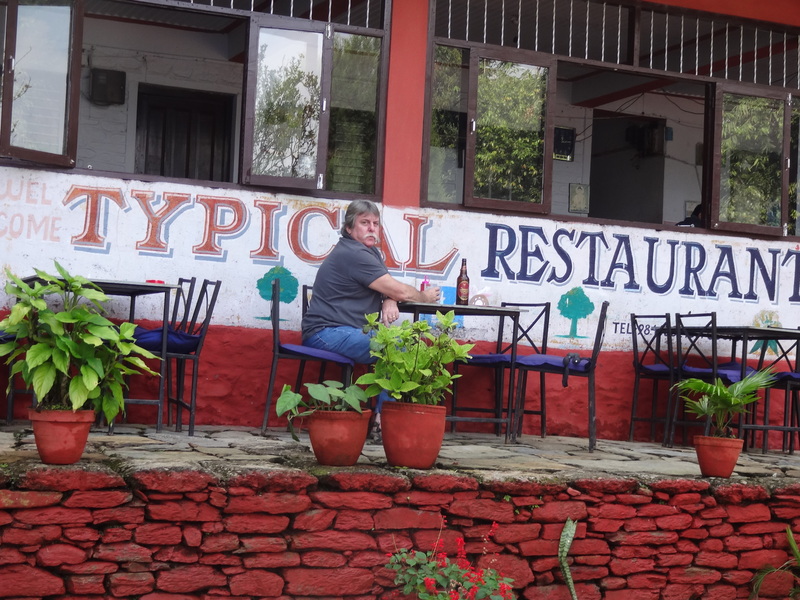 Our destination was the trailhead for the Pagoda Peace Temple trail, which was at a small lakeside restaurant called “Typical Restaurant”. I decided this was meant to mean “typical” in the traditional sense, although the geese didn’t seem to care one way or another. 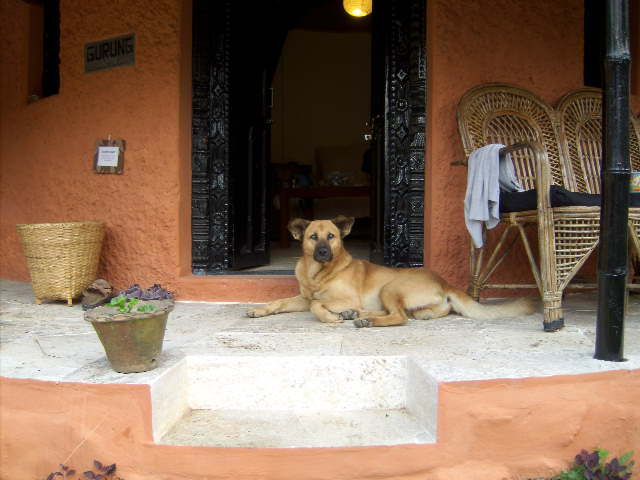 Robert deciding whether the place is typical or not…. 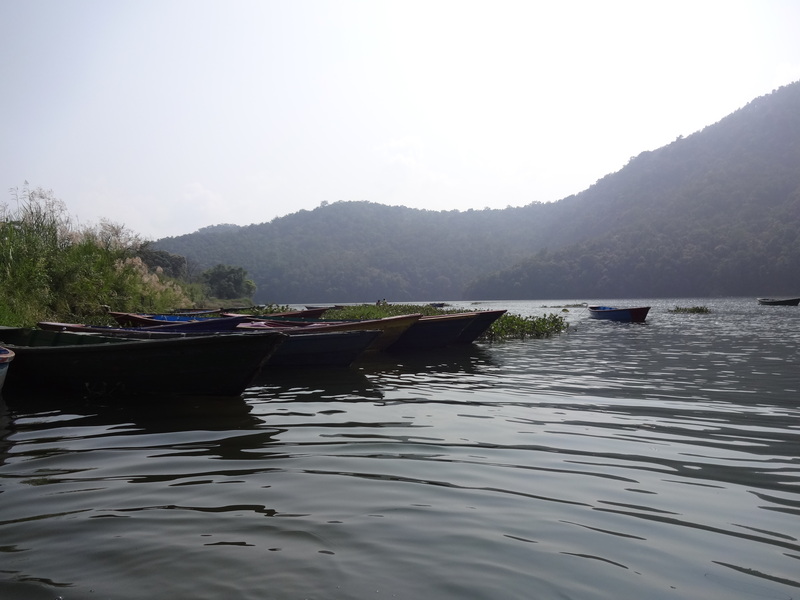 We made friends with a local who told us stories of the lake that he remembered as a child – a larger, less polluted lake that they would swim in as kids. 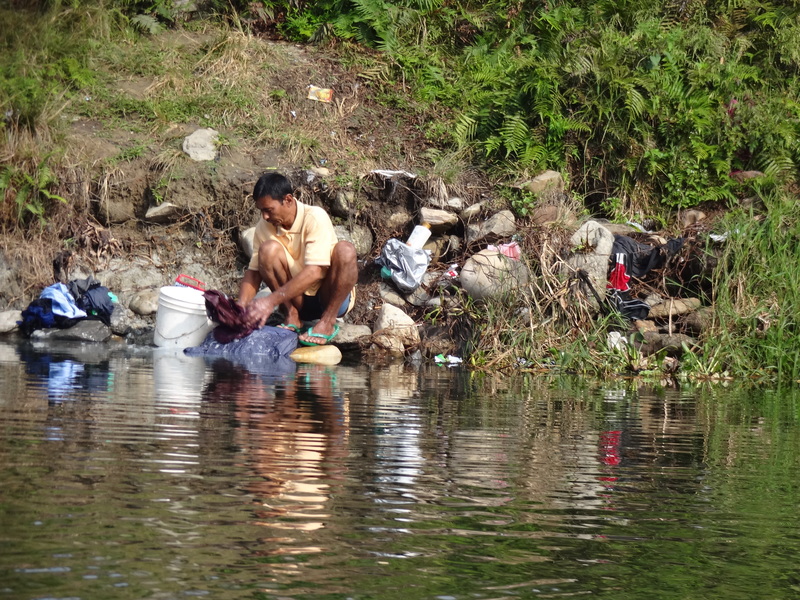 But its still pretty clean compared to Kathmandu, and the water still looks reasonably clean. He tells me that there are environmental groups working to keep the lake alive, which I am sure is an uphill battle, but I’m glad to hear someone is working to protect it before it is too late.